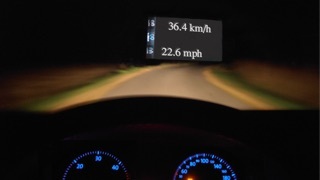 GPS Speedo displays your real speed in mph, km/h or m/s and comes with an integrated HUD (Head up Display). NEW: Alarm when previously speed limit is exceeded! 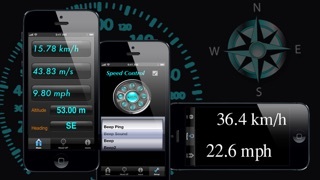 Included is an altimeter, which shows your actual height in meters above sea level. The HUD is very comfortable, it is projecting the actual speed direct on your windscreen and gives you the feeling to sit in a luxury car! Now also 23 different sound are included! SirAndrew1 write:"This App is cool as it reacts by simply moving the iPhone"
Now also is a speed warner included with 23 difference sounds! Note: To prevent the display from turning off while using the HUD go to Settings > General > Auto-Lock > Never. Don't forget to turn this on again after when GPS Speedo is not used anymore.